The inhabitants of Newfoundland and Labrador have, and likely had in the past, a close relationship with the ocean. The first aboriginal people who lived here nearly 9000 years ago relied on marine resources, just as many people in the province today rely on marine resources. To paraphrase an old saying the ocean gives and the ocean takes away. There have been hundreds or more likely thousands of shipwrecks off the shores of Newfoundland and Labrador ranging in size from small open boats to large modern ocean vessels hundreds of feet in length. Archaeologists are sometimes sent to investigate the remnants of these wrecks which, occasionally wash up on our shores. There is a specialized branch of archaeology, referred to as marine archaeology, which deals specifically with these marine resources. 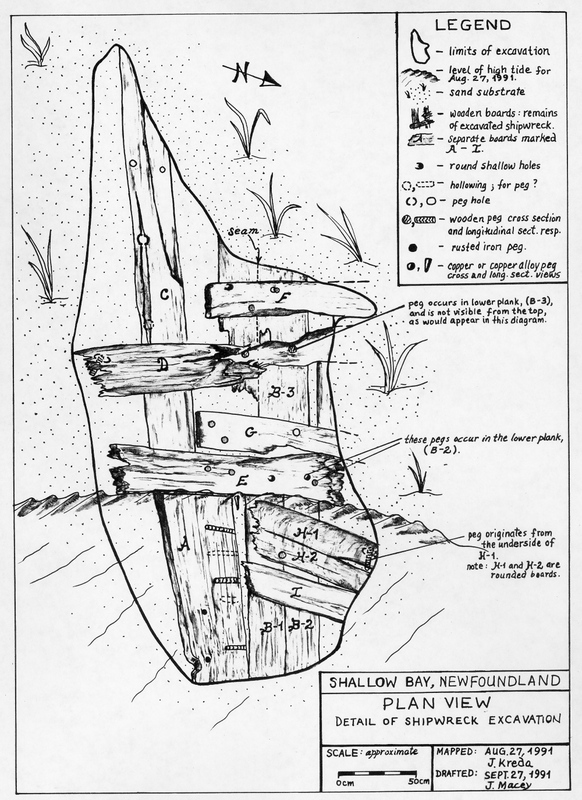 Marine archaeologists have been involved with two of the more famous wrecks in Newfoundland and Labrador; the San Juan in Red Bay and the H.M.S. Saphire in Bay Bulls. 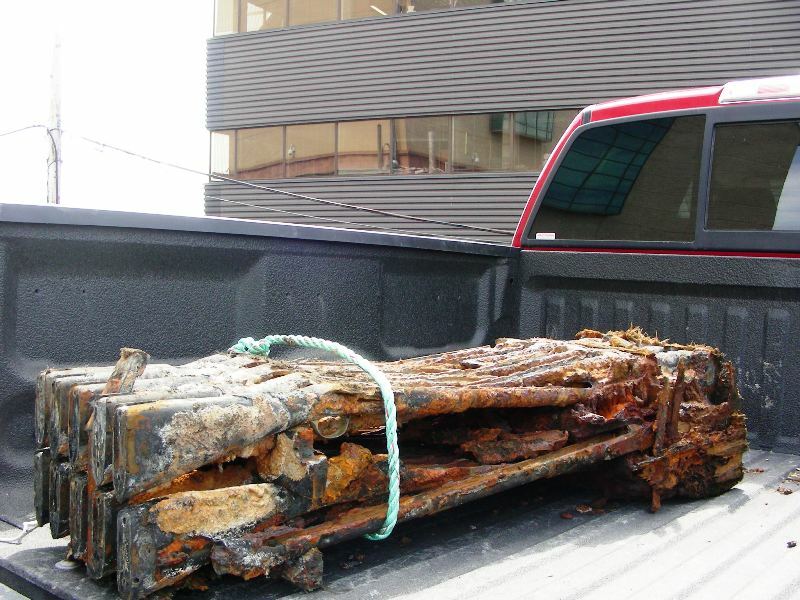 The San Juan was the focus of a Parks Canada excavation and both Parks Canada and the former Newfoundland Marine Archaeology Society excavated the H.M.S. Saphire. It was also the focus of a previous post on this blog. Less substantial portions of wrecks occasionally wash up on the province’s shoreline. 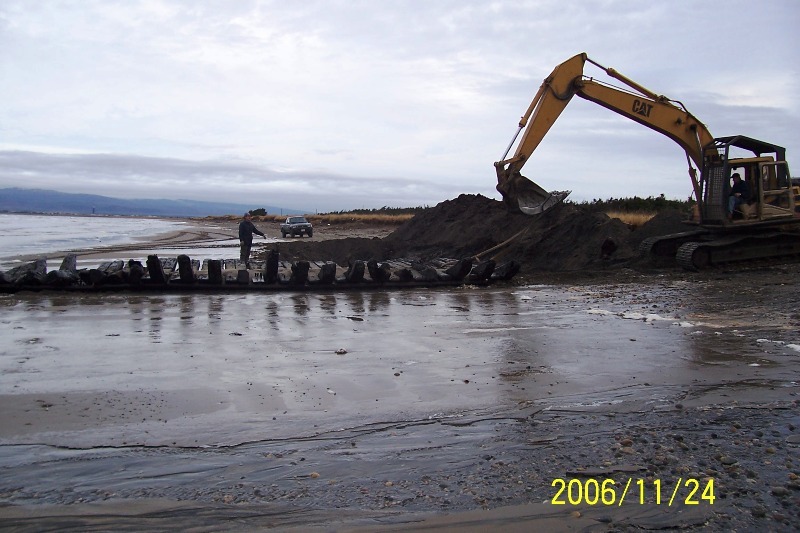 In 2006, the Provincial Archaeology Office was contacted about part of a ship that measured 13.5 x 6m in size that had washed up on the shore of Black Bank beach, near Stephenville. 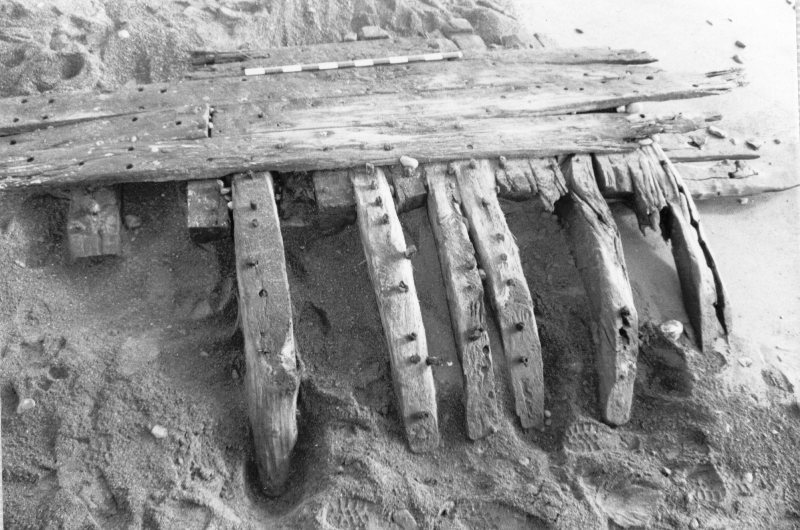 The fragment of a wooden ship’s hull had numerous wooden trenails (spikes) visible and holes where the trenails had fallen out. There were also several copper spikes. There was also noticeable outer planking over the heavy inner timbers. 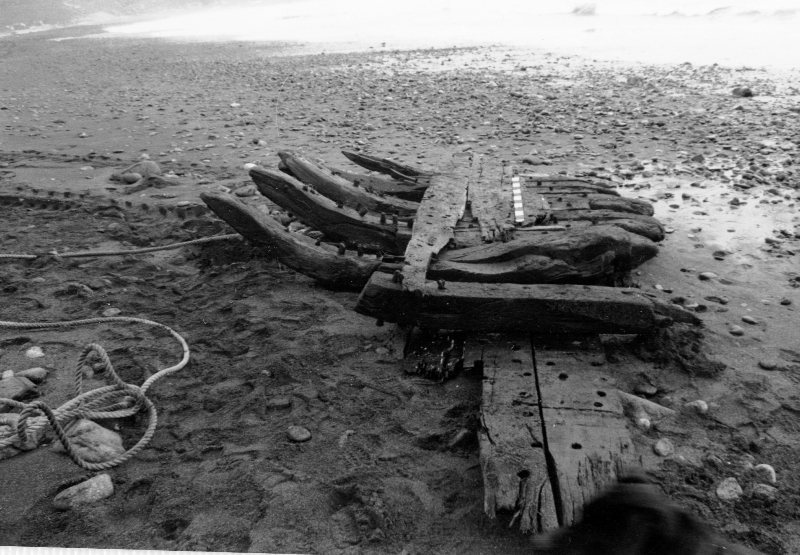 In order to preserve what remains of the wreck it was dragged ashore and buried in the nearby beach sand. Close-up shot of the copper spikes and wooden trenails. 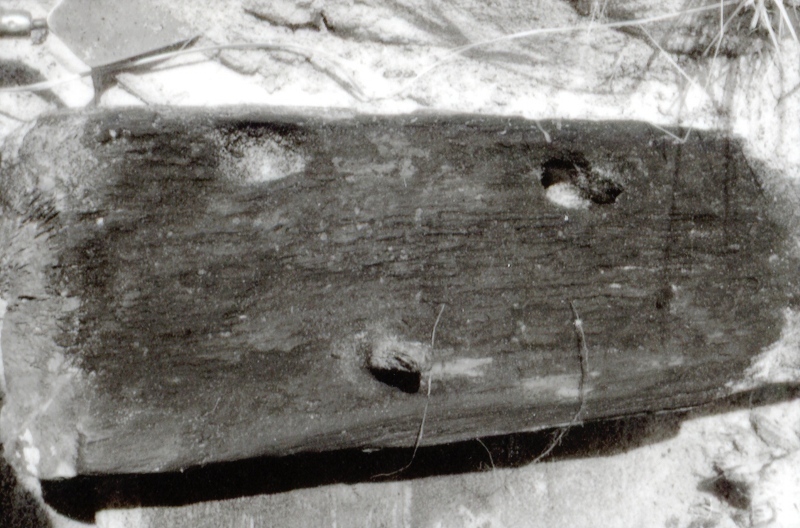 Close-up showing a square hole cut into the exterior wooden planking and the heavy inner timbers. Showing the wreck being buried. 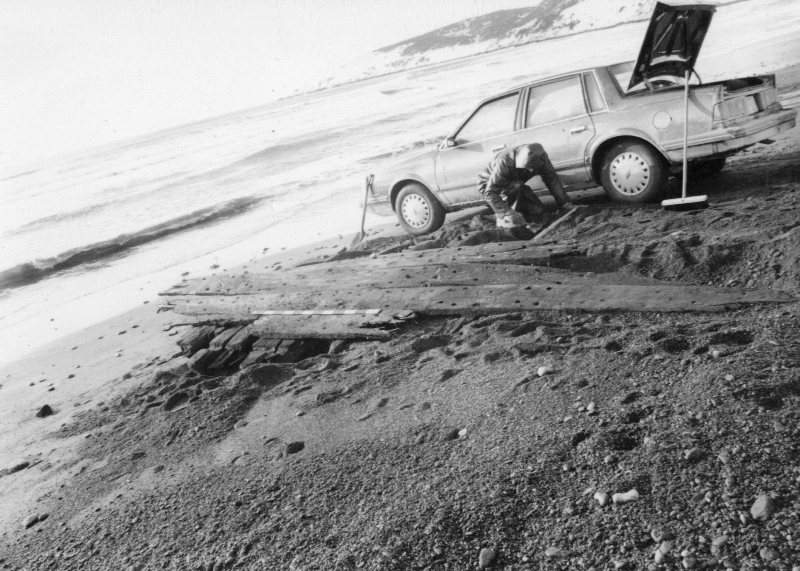 In 1990, archaeologists were called to investigate the remains of a wreck that was eroding from a sand bank on the Stanford River in Shallow Bay. The archaeologist exposed as much of the wreck as possible and took notes, photos and measurements. He noted the presence of square and round wooden trenails and iron spikes. The site was revisited in 1991 when a more detailed analysis was conducted. In 1991, the archaeologists noted the presence of copper or copper alloy spikes. 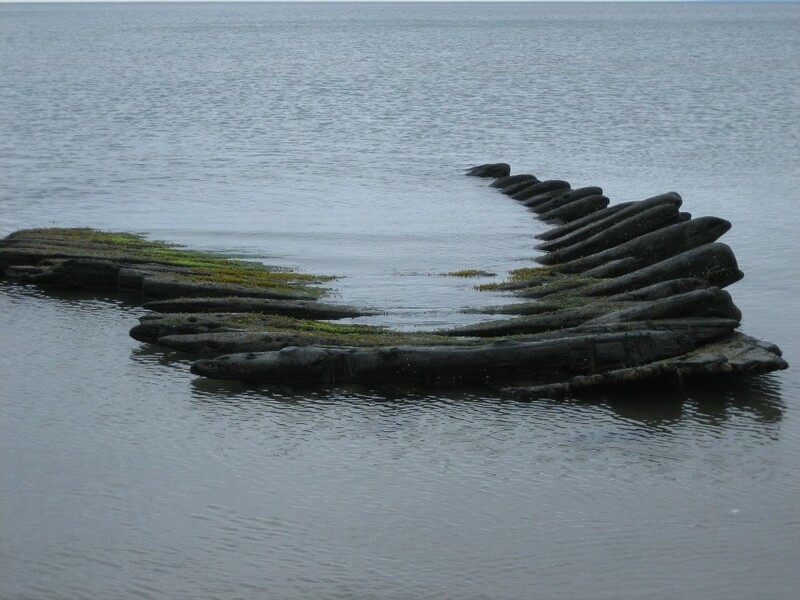 Similar to the Black Bank wreck, the Stanford River wreck had noticeable outer planking over the heavy inner timbers although it was much smaller with the largest plank being just 2.5 m long. 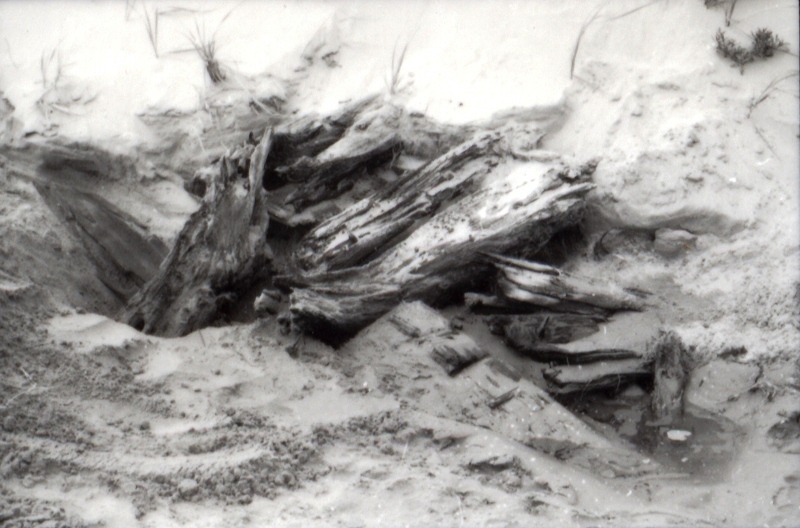 The archaeologists suspect another piece of wood was part of a keel. Map of the exposed part of the Stanford River wreck. Excavating the Stanford River wreck. Stanford River wreck exposed and in relation to the saltwater. 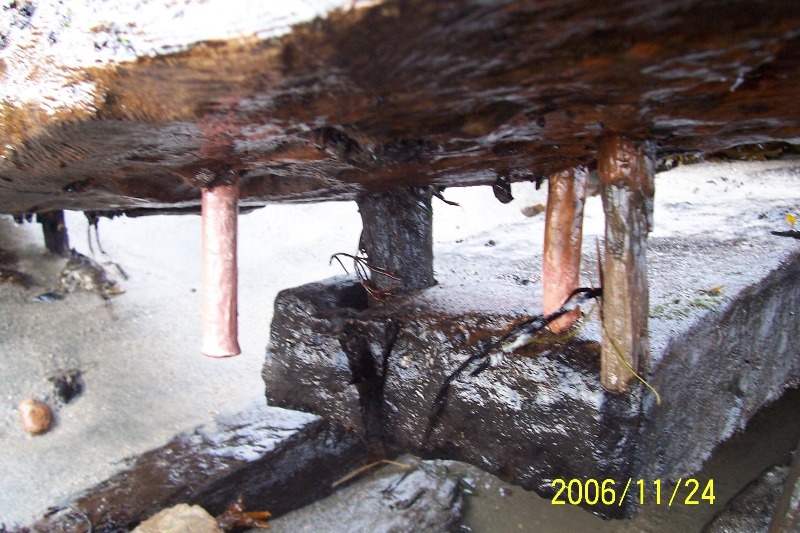 Stanford River wreck showing trenails and drilled holes. 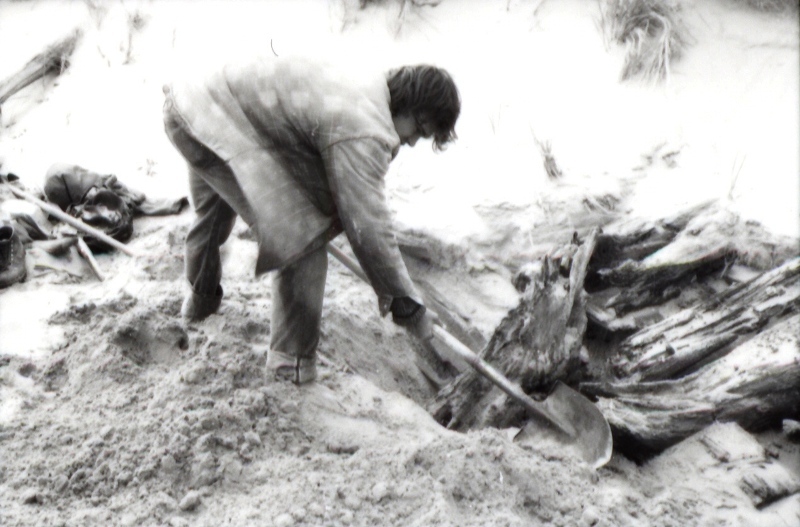 In 1989, archaeologists were called out in investigate part of a wooden wreck that was partially exposed in Lance Cove Beach, near the community of Point Lance on the southern Avalon. Wooden trenails and exterior planking over heavy wooden timbers were also found on this wreck but some of the interior wooden planking was also preserved. We know this wreck was made of White Oak. 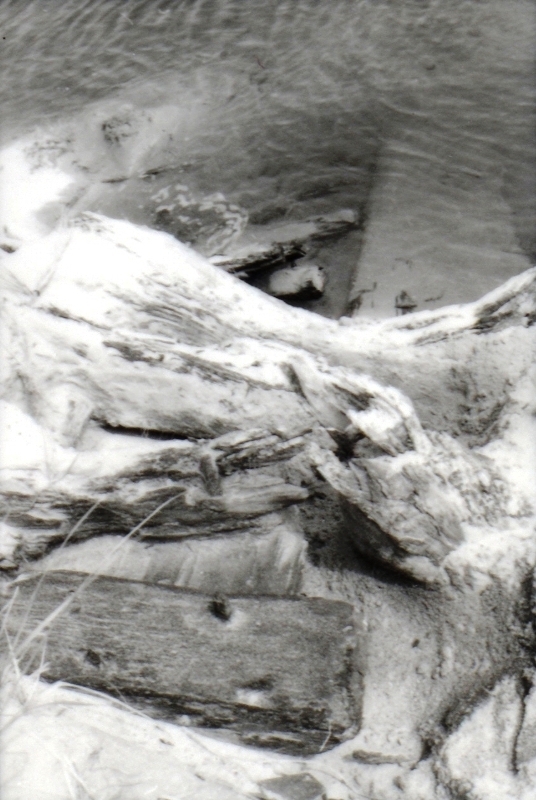 The Lance Cove wreck – note the trenails and exterior planking. Exposing the The Lance Cove wreck. 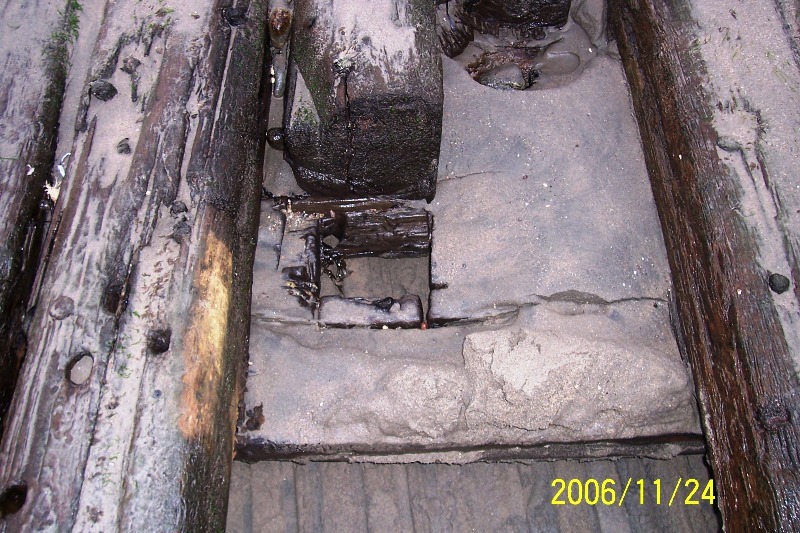 Interior of the Lance Cove wreck – note the trenails and interior planking. In my opinion, one of the most interesting discoveries in the ocean came into our possession in 2011. 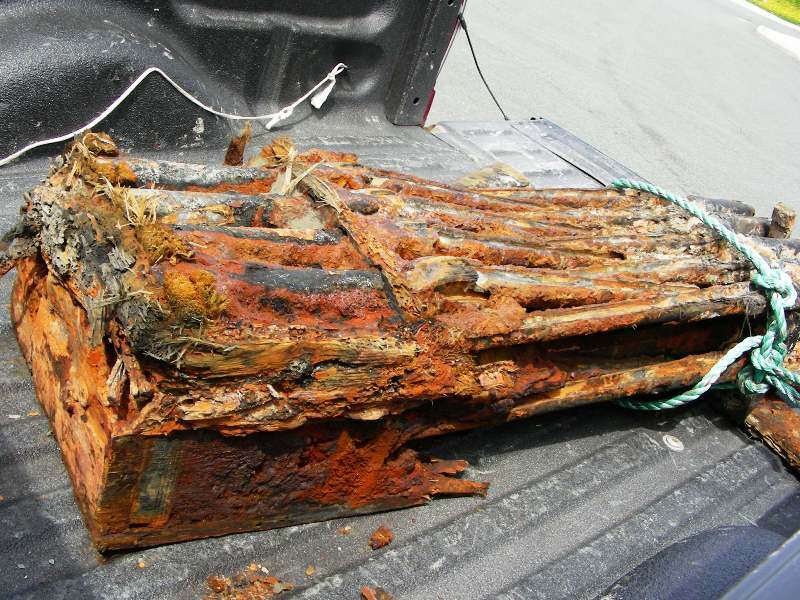 A crate of 19th century guns was found in the fishing net of the Newfoundland Lynx, an Ocean Choice International (OCI) fishing trawler. 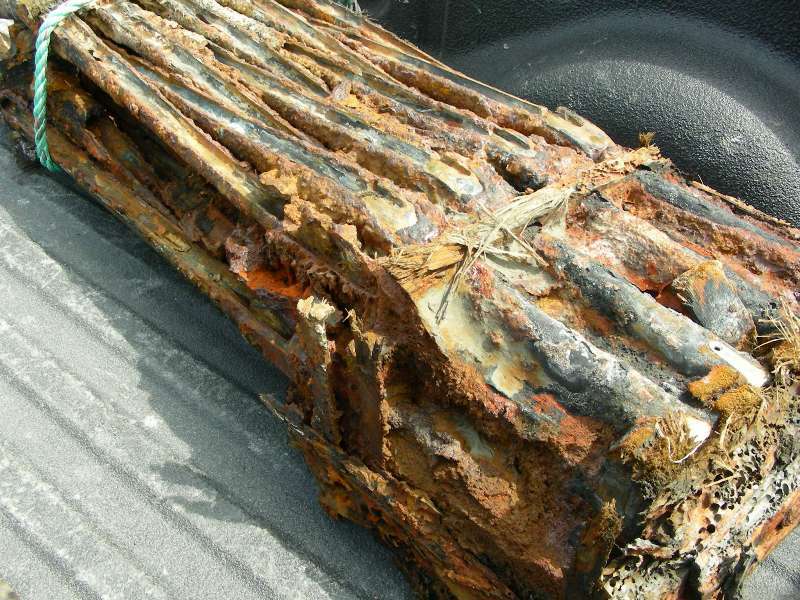 The guns were found offshore just inside the 200-mile limit and were brought to the attention of the Provincial Archaeology Office by OCI’s Operations Manager. They are currently undergoing conservation treatment. According to a military historian, the guns appear to be a bundle of 3-band P53 Enfield rifled muskets in what is left of their original crate and as packed at the Tower of London for shipment sometime in the 1850s-60s. These were the standard British arm in the 1850s-60s and the first standard British rifle. They were very popular with the British military and used in several wars and highly favoured by both sides in the American Civil War. These examples were likely new arms on their way from the Tower of London to arm either regular British Troops in Canada or the new Canadian militia. 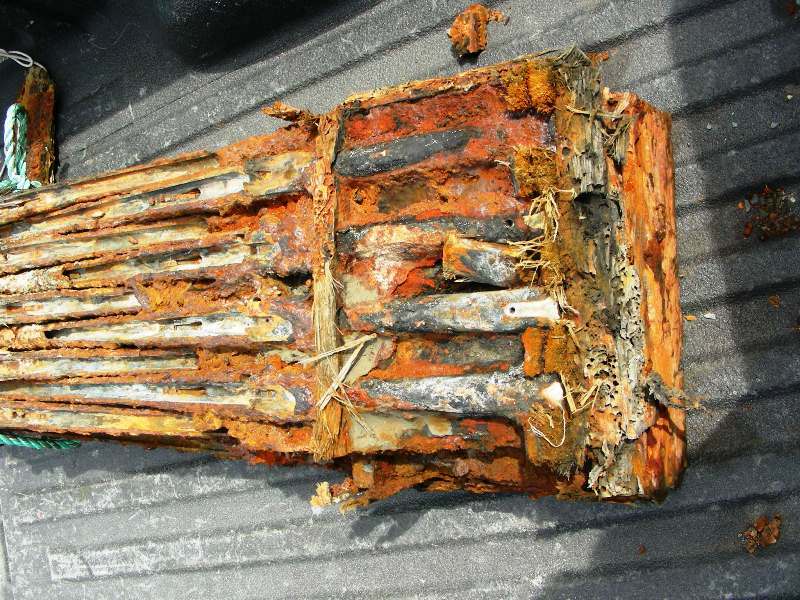 Eroded crate of 19th century guns. Fascinating when the see offers up some of her secrets. Of course for every one we find 10 or more will like undiscovered for ever. Every now and again we do get the one or two that sheds new light. I always live in hope of getting to see or read about the next big one. Indeed. Many will always be on the bottom of the ocean. All the useful information and facts found on your articles are mind-blowing. something new producing in there! Thank-you very much. I’m glad you find it to be a useful resource. Could the square hole in the outer planking be an attempt to drain the ship to salvage cargo or to refloat it. It does look like the hole might have been cut from inside, it that correct? The hole may have been used for something like that, but to be honest I don’t know enough about ship constriction to say for sure. Do you have any more information on what became of the Enfields? Were they sent to the Maritime Museum of the Atlantic? I’d like to do a piece on these muskets for Guns.com.